A garage is incomplete without a proper workbench. A sturdy workbench will not only store tools, but also creates space to complete those do-it-yourself projects. Most come with built-in-drawers and are equipped with a light to tackle projects after the kids have gone to bed. There are many options available, ranging from the sophisticated to simple. To take full advantage of your space, your garage must come equipped with plenty of lighting in order to allow you to work at convenient times in your busy schedule. Poor lighting hurts the quality of the work you are trying to accomplish and if a project requires small parts you don’t want to spend your time searching for tiny items on your hands and knees. If you prefer not to install a mounted light on your ceiling, invest in a portable light, a less-expensive option to create the lighting you need. A garage with tools on the floor and scattered across different surfaces isn’t the best for productivity. This haphazard approach leads to buying multiples of the same tool because you keep losing them in the clutter. A tool chest will keep items organized and save time whether you are working on a small repair or a long-term DIY project. How many times have you realized you have a flat tire and need an immediate replacement? For convenience, always keep a set of spare tires in your garage. Order a reliable tire brand from Tire Buyer to ensure your backup set of tires is of the highest quality. With a little preparation, a flat tire will no longer have to be a major setback in your day. Is your rake and broom in one corner and your bike on the ground? 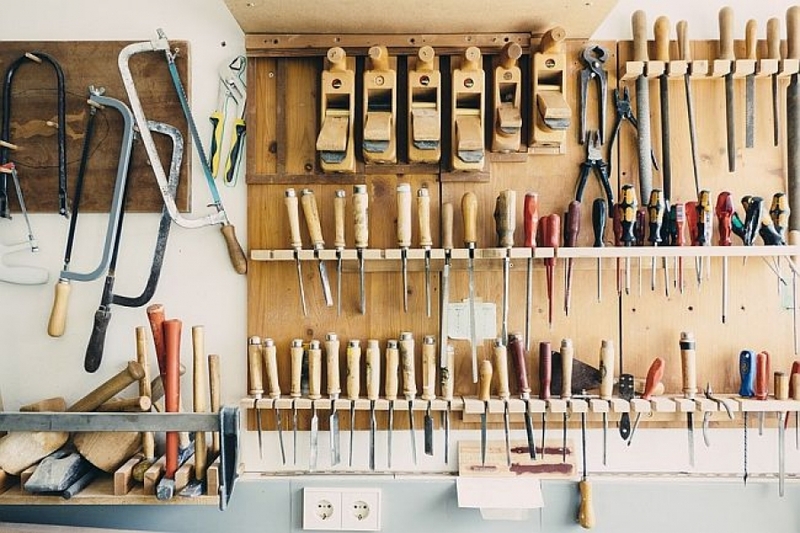 A functional garage needs proper storage options, like a peg board affixed to the wall. This storage option will accommodate your small tools, larger items and any miscellaneous tools unable to fit in drawers. If you prefer not to splurge on this expense, at least add sturdy hooks on the wall to store a garden hose, lawn equipment or other tools. With items hung up out of the way, your garage will appear clean and neat. If you like home improvement projects, keep appropriate safety gear in your garage. Invest in protective goggles, gloves and masks to protect your face. Keep a small first aid kit handy for minor emergencies. To give your garage a polished looked, consider adding an upgraded finish to your floors. Coat the cement with epoxy or tile – this will give your garage an instant face-lift and make it look more appealing.